This year's Newbery winner. Also a Cybils finalist. 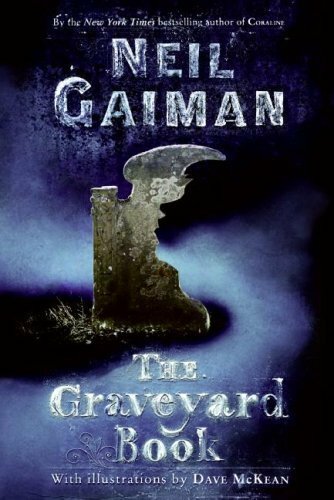 It's called The Graveyard Book to echo The Jungle Book, because the stories follow a similar pattern. I had forgotten that and was reading along when for some odd reason I decided to read the acknowledgments. In them Neil Gaiman recommends reading Kipling's The Jungle Book especially if you're only familiar with the classic Disney adaptation. So that makes me curious, and now I want to read it. Most favorite: I liked Silas a lot. He's the guardian of our graveyard boy, Nobody Owens, and Baguira's counterpart if you will. He is mysterious and reserved and wise. Little hints throughout the book let you know how he knows so much about both the living and the dead. Actually, most of the characters were awesome. Miss Lupescu and Mr. Frost stick out in my mind. Least favorite: Well, Dave McKean's illustrations are wierd, but I mostly just ignored them. Any fans out there? I'd love to hear why you like him. Overall, a good book. It would be fun to read aloud with kids. There are some very memorable scenes -- that's how Jungle Book is for me too -- I remember certain bits better than others. That's probably a product of the way the story is written. Smaller vignettes make up the larger story arc. The Jungle Book is incredible. There are two volumes. Amazingly vivid stories that are entertaining and emotional and don't talk down to children at all, while still appealing to them beautifully.